For small inscriptions it's acceptable to carve flat on the bench or in the vice. Larger, more time-consuming ones need to be fixed at a slight angle that replicates being upright when you are sitting comfortably to work. The tools chosen for the appropriate sized letters should be placed on one side and all facing you for easy access and recognition. Make sure you have the written text from the client before you start in case of any inconsistencies. Have a movable light to replicate the ultimate light source. A square placed on the bottom of the board will help to create an upright feature ensuring the 'wavy' grain does not deceive your eyes. There are many different fonts but not all transcribe easily into a cut letter, so beware. The beginner should start with letters of a clean and plain design such as Roman letters, which eliminate flamboyant curves. These have serifs at the ends of the letters that are efficient to cut. Square-ended letters - without serifs - are tricky as the square cuts need to be extremely precise and are noticeable if not. 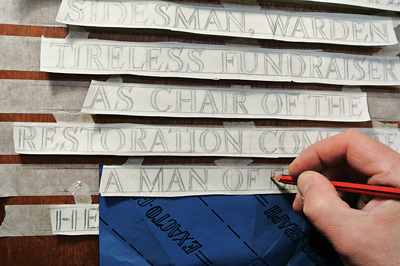 Most inscriptions have incised 'V' cut letters at approximately 60º to the surface. 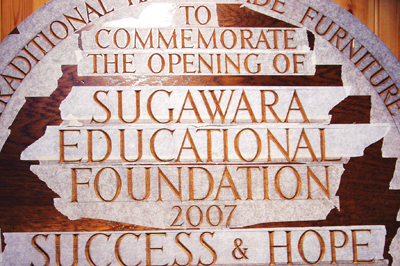 These are easier to cut and therefore cheaper than a raised inscription, where the background has to be reduced to raise the letters, which is time-consuming. Initially, to execute this type of work you need to gain an appreciation of each letter's proportions and balancing the spaces between the letters - this can only be gained by practice, followed by more practice. With experience the human eye can 'visually' balance these areas faster than any mechanical device. Attention is very often not given to a couple of observations regarding proportions. All circular letters - O, Q, G and C - are drawn with the top of the letter slightly above the top line and the bottom slightly below the bottom line; this counteracts an optical illusion. If ignored, our eyes see the overall width of the letter and perceive it to be short in height. This therefore does not include the zero in numerals if not a consistent circle. Similarly, all letters that have points on the top or bottom lines - N, M, W, A and V - have their points slightly passing through the line. Again, this is to counteract an optical illusion; our eye does not register the area of the point and so perceives the letter to be short. Allowing the point to slightly pass through the line prevents this. Photocopying or printing a font to the appropriate size you require does provide a shortcut and allows you to cut up and stick individual letters along a line to adjust the spacing. Be aware that their proportions are not always correct and usually do not incorporate the features mentioned above, so adjustments will be required. 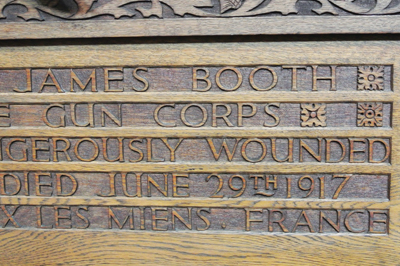 Instruction is often given where you glue the paper of the drawn or printed inscription onto the surface of the wood, but this is inappropriate, as the paper may be difficult to remove after the letters are cut. You do not want to resort to sanding the surface to remove the adhesive, as this would make the letters shallower and obviously change their proportions. 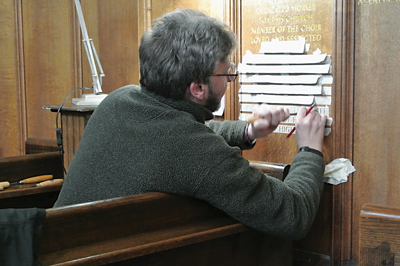 Gluing paper on highly polished panels in a church and then sanding them would obviously be unacceptable. 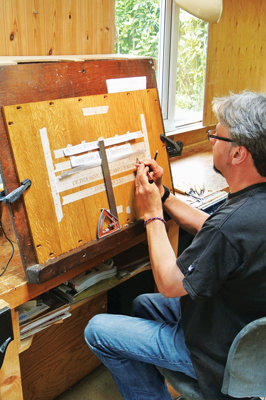 If the inscription is to be painted or gilded, apply masking tape to the panel's surface first. 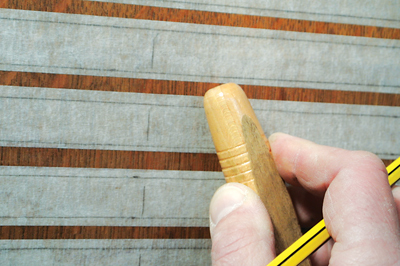 Ensure the masking tape adheres to the surface of the panel by rubbing it with the side of a chisel's handle. Copy the inscription onto the tape using carbon paper and cut the letters through the tape. Seal the grain of the cut wood with a clear lacquer or oil, which will prevent the paint 'bleeding' or soaking into the end grain of the cut timber. Paint or gild the letters as appropriate while the masking tape is in place. The obvious advantage of this is that you don't have to be precise when painting the inscription. You can easily remove the tape when the letters are dry, leaving a clean edge to the decorated letters - obviously this also eliminates the absurd need to sand off any adhesive! I've seen procedures given to remove the paper or tape before you seal and decorate the letters so that, subsequently, every letter has to be individually decorated; how counterproductive, what a waste of time - akin to jumping from soap box to soap box!